Meineke Car Care franchise business opportunity. Free Meineke Car Care business franchise information. 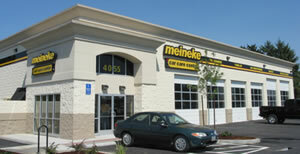 Meineke is one of the most recognized franchised brands in the automotive aftermarket. A comprehensive advertising program that features a nationally recognized spokesperson. The program covers National Television, Internet Advertising, complete Yellow Pages, all creative materials, and in-depth local marketing and advertising programs. Meineke is the 13th largest Yellow Pages advertiser in the nation. Two mile protected territory and a 3rd mile right of first refusal. Site location assistance that includes in-depth market analysis using the most up-to-date technology and current real estate listings. Meineke's site location resources are available to assist you in your site selection. Access to a network of Real Estate developers and brokers is also available to provide individual assistance. <?xml:namespace prefix = st1 ns = "urn:schemas-microsoft-com:office:smarttags" />Meineke University offers a four-week training program in Charlotte, NC, that will teach you necessary management and technical skills. Hotel and travel expenses for up to two franchisees who originally sign the franchise agreement are included. Meineke has one of the only electronic interactive training programs in franchising. Ongoing training in the field is a major objective of our Operations and Training Departments. In year 2000, more than 24,000 man hours of training were provided in the field. The Operations Department provides ongoing training and consulting services to you in your shop. Your operations manager will work with you individually on all aspects of improving your business. In addition, through its comprehensive dealer access web site, Meineke provides ongoing 'online' training and a communication network. National buying power of over 850 Meineke shops to obtain significant price discounts from the automotive industry's leading vendors. You will benefit from the knowledge and experience that we have accumulated over our 30+ years and nearly 900 operating shops domestically and internationally. Today, the consumer recognizes Meineke as a provider of a broad range of services including brakes, ride control and maintenance services which is fueling solid sales growth. Enjoy the rewards of owning your own business while benefiting from being part of a successful franchise system. Take control of your own future and build the sort of life you always wanted. This opportunity doesn't require a knowledge of vehicle repair. We're looking for entrepreneurial people who can effectively manage a business and direct a productive team of professionals. Our comprehensive training program will fill in the blanks. To Learn more about the Meineke Franchise opportunity, simply complete the form below.